Carinthia however remained a separate entity, and in 1012 Count Adalbero I of Eppenstein, Margrave of Styria since about 1000, was vested with the duchy by the last Ottonian emperor Henry II, while the Istrian march was separated and given to Count Poppo of Weimar. Adalbero was removed from office in 1035 after he had fallen out of favour with the Salian Emperor Conrad II. In 1039 Carinthia was inherited by Emperor Henry III himself, who split off the Carniolan march the following year and granted it to Margrave Poppo of Istria. 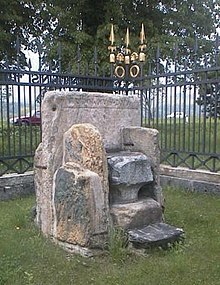 In 1077, the duchy was given to Luitpold, again a member of the Eppensteiner family, which, however, became extinct with the death of Luitpold's younger brother Henry III of Carinthia in 1122. Upon his death the duchy was further reduced in area: a large part of the Eppenstein lands in what is today Upper Styria passed to Margrave Ottokar II of Styria. Rudolf, after being elected King of the Romans and defeating King Ottokar II, at first gave Carinthia to Count Meinhard II of Gorizia-Tyrol. 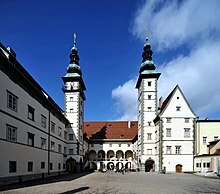 In 1335, after the death of Henry, the last male of this line, Emperor Louis the Bavarian gave Carinthia and the southern part of the Tyrol as an imperial fief to the Habsburg family on 2 May in Linz. The Habsburgs would continue to rule Carinthia until 1918. 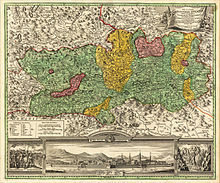 As with the other component parts of the Habsburg Monarchy, Carinthia remained a semi-autonomous state with its own constitutional structure for a long time. The Habsburgs divided up their territories within the family twice, according to the 1379 Treaty of Neuberg and again in 1564. Each time, the Duchy of Carinthia became part of Inner Austria and was ruled jointly with the adjacent duchies of Styria and Carniola. Empress Maria Theresa of Austria and her son Joseph II attempted to create a more unitary Habsburg state, and in 1804 Carinthia was integrated into the newly established Austrian Empire under Francis II/I. 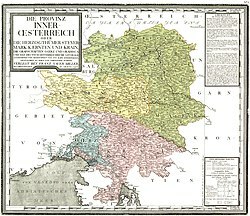 According to the 1809 Treaty of Schönbrunn, the Upper Carinthian territories around Villach formed part of the short-lived Napoleonic Illyrian Provinces; Carinthia as a whole remained a part of the Habsburg Kingdom of Illyria until its dissolution in 1849. Following the end of the war and the dissolution of Austria-Hungary, the 1919 Treaty of Saint-Germain stipulated the Carinthian Canal Valley stretching from Tarvisio as far as Pontafel (172 square miles) go to Italy and that the Slovene-speaking areas of the Meža Valley, the Drava Valley area around Unterdrauburg, which was afterwards renamed Dravograd, and the Jezersko area (128 square miles of territory) be ceded to the new SHS State. 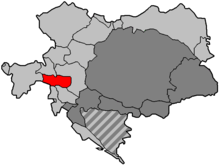 The Kingdom of Serbs, Croats and Slovenes, however, was not satisfied with these parts of the former duchy and also occupied land north of the Karawanks mountain range, including the capital city of Klagenfurt. The Entente powers decided on a two-stage referendum, of which the first stage, the Carinthian Plebiscite was held on 10 October 1920 to determine the fate of Carinthia. The outcome in favour of Austria did not change the borders as decided upon in the Treaty of Saint-Germain.